Egypt's Protests; Day Seven: Anti-Mubarak Demonstrators Stay Put : The Two-Way There are calls for a million people to march on Tuesday, and protesters are trying to force President Hosni Mubarak to step down by week's end. A protester in Cairo's Tahrir Square earlier today (Jan. 31, 2011). Thousands of protesters who want Egyptian President Hosni Mubarak to step down are in Cairo's Tahrir Square again today, as the demonstrations that have rocked that nation are in their seventh day. As NPR's Soraya Sarhaddi Nelson reported for Morning Edition, the most populous Arab nation has been turned "on its head" by the crisis. We'll keep following the news about events in Egypt as the day continues. Click your "refresh" button to make sure you're seeing any updates. 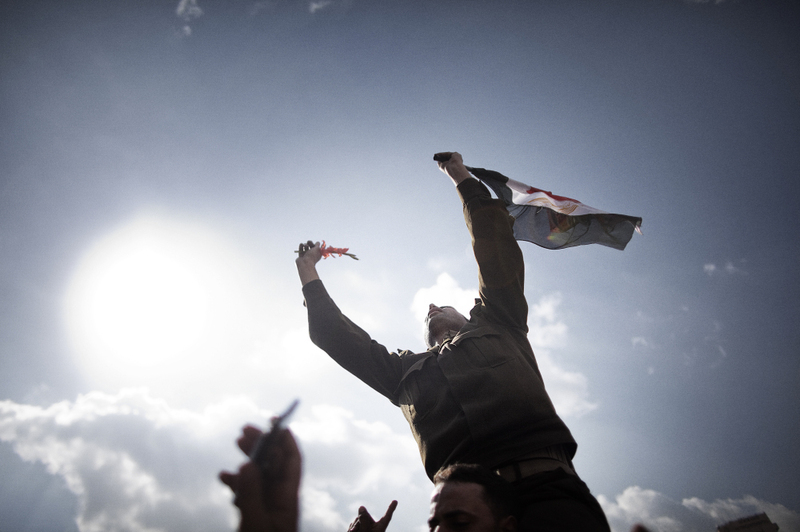 An Egyptian army Captain identified as Ihab Fathi holds the national flag while being carried by demonstrators during a protest in Tahrir Square in Cairo on the seventh day of mass protests calling for the removal of President Hosni Mubarak. Update at 7:06 p.m. ET: The only internet service provider that was still working in Egypt is now disconnected. The people I talked to mostly insisted that the army would never open fire on civilians. I hope they're right. To me, the scene here is eerily like that of Tiananmen Square in the first week or so after martial law was declared on May 20, 1989, when soldiers and citizens cooperated closely. But then the Chinese government issued live ammunition and ordered troops to open fire, and on the night of June 3 to 4, they did – and the result was a massacre. Update at 3:58 p.m. ET: Addressing the nation on state television, Omar Suleiman, whom Hosni Mubarak appointed as vice president, said he's been instructed to negotiate with all political parties and that the talks would lead to constitutional and legislative reform. Update at 2:15 p.m. ET: Asked specifically if by speaking of the need for a "transition" in Egypt the U.S. is effectively saying it believes Mubarak should step down, White House spokesman Robert Gibbs said "no, that is not for our country or our government to determine." He repeated that "orderly transition means change" and that change means an increase in "the amount of freedom that is had by the Egyptian people." It is up to "the people of Egypt" to determine what happens, Gibbs repeated. Update at 2 :03 p.m. ET: At the White House a moment ago, spokesman Robert Gibbs said "it is not up to us to determine when the grievances of the Egyptian people have been met by the Egyptian government." "We're not picking between those on the street and those in the government," Gibbs added, as the Obama administration continued to weigh its words carefully when asked about whether the U.S. supports Mubarak or those who are calling on him to step down. And he referred reporters to previous comments by Secretary of State Hillary Rodham Clinton, who said yesterday that the U.S. wants to see a "transition" in Egypt to a more open and democratic society. The BBC reports that "while asserting that it 'will not use force against the people,' the Egyptian army has also warned against 'the carrying out of any act that destabilises the security of the country,' according to state television." Reuters has also moved an "alert" about the Army's statement. As we said Saturday, how the Army reacts to events is critical. "The new minister, Mahmoud Wagdi, is the former head of criminal investigations. He's said to have had tense relations with his predecessor, Habib el-Adly, whose departure has been a key demand of protesters. The Interior Ministry oversees the police and security forces dreaded by many Egyptians, who claim those forces operate with impunity. Whether the change in ministers will be enough to appease demonstrators seems unlikely, however." "Several thousand people joined in prayer as sun set in #Alexandria Martyr Square, one of many demos defying curfew." "I think Mubarak either oversees a bloody crackdown, and army obeys (neither certain, both possible)—or he's out." Update at 11 a.m. ET: NPR's Andy Carvin, who previously wrote for us about how to follow events in Egypt on Twitter, has put together a Twitter list of valuable contributors. You can follow it here. Update at 9:10 a.m. ET. American Evacuation: "The first of two charter planes carrying U.S. citizens out of chaotic Egypt landed Monday in Cyprus, the beginning of what could be a lengthy evacuation effort amid escalating unrest across the country," CNN reports. Update at 8:55 a.m. ET: Al Jazeera now says that its six journalists who were detained by authorities earlier today in Cairo have been released. Their equipment was confiscated, the network adds. Update at 8:15 a.m. ET: Al Jazeera says six of its journalists in Cairo have been arrested by authorities. The network continues to live-blog here and to stream its English broadcast here. — "Egyptian protesters have called for a massive demonstration on Tuesday in a bid to force out president Hosni Mubarak from power," Al Jazeera says. Organizers hope to have "more than a million people on the streets of the capital Cairo, as anti-government sentiment reaches a fever pitch." 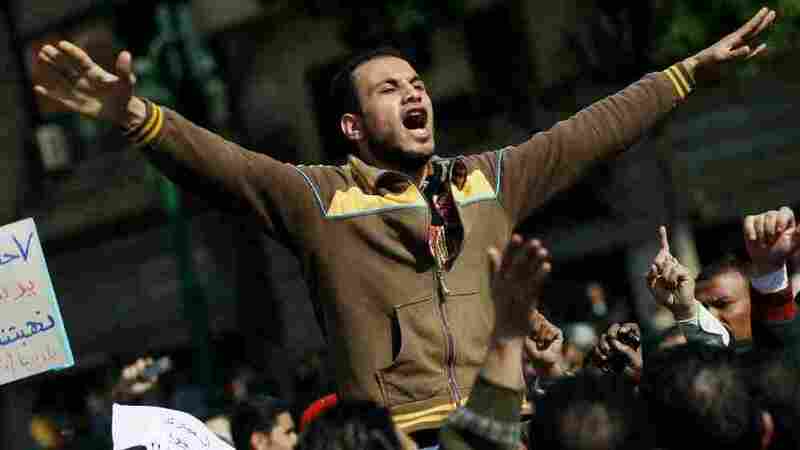 — The Associated Press says that "the coalition of groups, dominated by youth movements but including the outlawed Muslim Brotherhood, said it wants the march from Tahrir, or Liberation Square, to force Mubarak to step down by Friday. Spokesmen for several of the groups said their representatives were meeting Monday afternoon to develop a unified strategy for ousting Mubarak. The committee will also discuss whether Nobel Peace laureate Mohamed ElBaradei will be named as a spokesman for the protesters, they said. ElBaradei, a pro-democracy advocate and former head of the U.N. nuclear watchdog, invigorated anti-Mubarak feeling with his return to Egypt last year." — The BBC reports that its correspondents "say all the signs continue to suggest that the only change the protesters will settle for is Mr Mubarak's removal from office. Meanwhile, Moodys Investor Services has downgraded Egypt's bond rating and changed its outlook from stable to negative, following a similar move by Fitch Ratings last week. Both cited the political crisis."